Glastonbury skatepark was designed and built by Maverick Industries, opening in 2008. 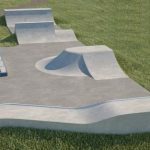 It is a large all concrete park with street and transition aspects all mixed in together and can be found on the edge of town. 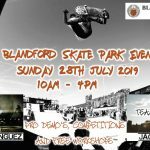 The skatepark starts on one side with a half pipe with different height edges and spined onto the back of one side is a quarter pipe, flat bank with extension and a driveway with rail and hubba leading out of it. These then open up onto a flat area with a pump bump after which follows a bowled area and funbox with extension and euro gap on one side. Running around the outside of the coure is a series of ledges and rails of all shapes and spined onto the back of the half pipe is a series of staggered ledges with gaps and a stair set and rail leading up to it. 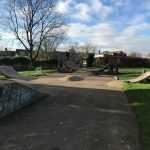 Glastonbury skatepark is a great local spot that has something for everyone and has been well designed to incorporate a decent selection of obstacles. The surfaces are smooth and fast to help create long flowing lines around the park making it a perfect place for beginners and experienced skaters alike. 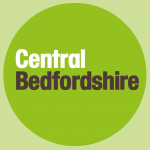 Castle Cary train station: As it is such a long distance from the station it would be recommended to get a bus or a taxi to get to Glastonbury skatepark. Wirral Park Roundabout bus stop: Exit the bus onto Street Road and head south until Glastonury skatepark is on your right.